I recently became a father for the first time and had the pleasure of learning about a whole new world of stuff that a baby supposedly needs. One of our purchases was a Chicco Next To Me Crib as my wife wanted the little’un to be within reaching distance when she was loafing in bed sleeping. Having used it for a few weeks now I thought I’d share my experiences with it. In short, I’m rather impressed with its design and sturdiness. The fact that it also doubles as a travel cot is not a feature we bought it for. On the odd occasion we’ve travelled with it, it was very easy to do so. I’m not generally one for reading instructions, though I did for this as it’s not a cheap item and I didn’t want to break it. I’m glad I did though as it highlights how easy the Chicco Next To Me Crib actually is to use! Two legs, a support that fits onto them, and a mattress. 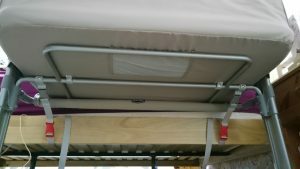 There are also some straps to secure the cot to your bed to minimise the risk of any small arms or legs getting stuck in between. All with a convenient bag to put it in, and despite early struggles, it does all fit in there very neatly. The mattress has a (removable) hardboard base. 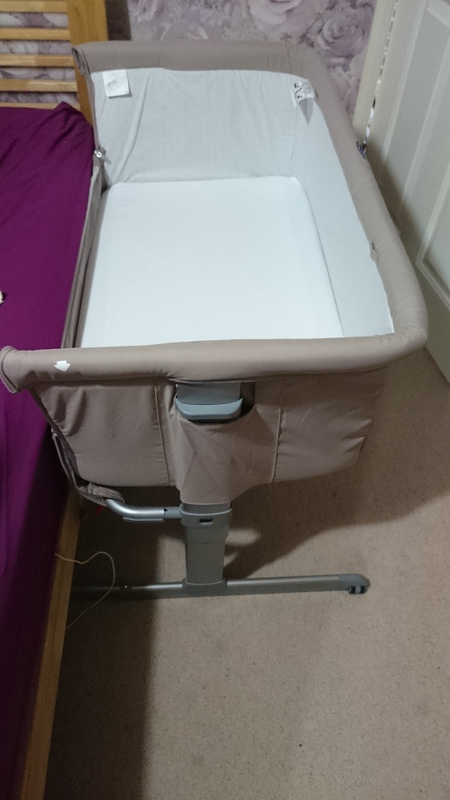 Those of you with a baby monitor with a sensor pad can slip it in without hacking your nice-looking travel cot apart. The fabric is wipe-clean, thick and the stitching is good. No loose ends or anything of mention. Everything fits where it should with no badly machined parts and it does exactly what I’d expect, well. I was absolutely amazing at assembling and dismantling the Chicco Next To Me Crib after about three goes. I’ve got it down to less than five minutes, and that’s with using the straps. The straps are a bit fiddly, though that is likely specific to our bed. I have to thread them round the frame and under the mattress. Having to lie on the carpet like a mechanic to connect them also slows me down. Incidentally, they are not permanently attached to the crib so you can attach them to the bed then clip them on. Wife says the mattress is a bit hard, though doctors recommend a firm mattress. With that in mind, I doubt any baby mattress is going to be much different. In the shops they all seemed similar to the touch to me. Final whinge is that the Chicco brand sheets to fit this are rather steep in price. Other retailers have obviously noticed this! You can get the DK Glovesheets brand at a much more reasonable price from Amazon UK.